user 2018-07-15 2019-04-08 Leave a comment on How to choose a kayak? Looking for a kayak? With so many options, it is important to have a reference base from which to compare styles, sizes, materials and more in order to get the right kayak for your use. There is no need to pay for extras which you will never use. Some features may not sound impressive in descriptions of kayaks but actually offer sound construction for your pound. Learn to differentiate essentials for your kayak and compare designs and compositions using these pointers for choosing a kayak that will enhance your outdoor experience. Factors to use in choosing between kayaks include seat style – whether it is a sit on top or sit inside model. What type of things you most commonly do with your kayak – Whitewater, Sea, or recreational touring. Next comes the design, material, weight, durability, and cost. Seat style is a matter of choice and use. If you like to play around in the surf and do not feel at ease with rolling your kayak back upright, a sit on top model may be more comfortable than a model where you sit inside the kayak. With a sit on style, you can go fishing as well as paddling, and if you would like a nap, spread out on top of the craft for an hour or two. The largest benefit is that sit on models are self-bailing, so you will not be able to fill your boat with water. On the negative side, these types of kayak are usually wider than their counterparts, and slower. You will not have body control over the kayak unless you also have thigh straps. Sit in kayaks are easier for storing gear, keep you dryer, and with your cockpit properly fitted can give you more interactive experience with your body controlling the kayak. Some say it is almost like an extension of the body. They will require bailing implements in case you take on water or flip the kayak over. Your usual kayak activities will also affect the type of kayak you choose.A Whitewater kayak is designed for the rapids, and has no keel. They are very easy to move around in the water, and the cockpit is built to be tight so you are securely held in the boat. These models are shorter, generally under ten feet. Recreational kayaks are good for beginner and low intensity paddling enthusiasts. Generally, they are built to be very stable and with a large seating area. They are useful in slow rivers and creeks, lakes, flat water, and ponds. For those who like to fish, hunt, or take photographs, this style of a boat will suit you well. Touring kayaks have a good keel, are stable, and the cockpit is larger to add paddlers comfort during longer trips. They also have bulkheads, and large access hatches to keep dry storage safe. Gentle water such as bays, wide rivers, inlets, and lakes make the ideal playground for a touring kayak. Rudders and outriggers are some features in the touring models. For ocean paddling, you would want a sea kayak. They sit low in the water, contain smaller cockpits, smaller access hatches, and bulkheads. They may also come with skegs or rudders, compass housings, and deck mounted pumps. Sea kayaks are used where you would imagine – the open ocean. Considerations when looking at kayak design include: turning vs tracking, edging, primary vs final stability, comfort, speed, size, ease of handling/transporting/storing. The main materials from which kayaks are made includes plastic, Kevlar, fibreglass, wood, inflatable plastic, carbon, and a frame and fabric construction. When looking at overall cost, consider the materials you are buying. While plastic is heavy, it is usually the hardest to damage. If it is damaged, welding will be necessary. Fibreglass is lighter than plastic, but the cost is generally twice or thrice that of plastic models. When you look into lesser-known materials such as Kevlar and carbon fibre, the kayak weight goes down exponentially. Unfortunately, the cost goes up just as exponentially. It is rare to find wooden kayaks, though some kit models exist. Another light material is a fabric over a wood or metal frame. Good for hiking because they fold up, the kayaks made of fabric are among the most expensive. Inflatable kayaks can provide good value for the pound. They are easy to store and transport and durable enough for Whitewater and surf. They generally do not track the same as a hard-shell kayak. You can find them in low prices to much more expensive models. For this type, price tends to follow quality. 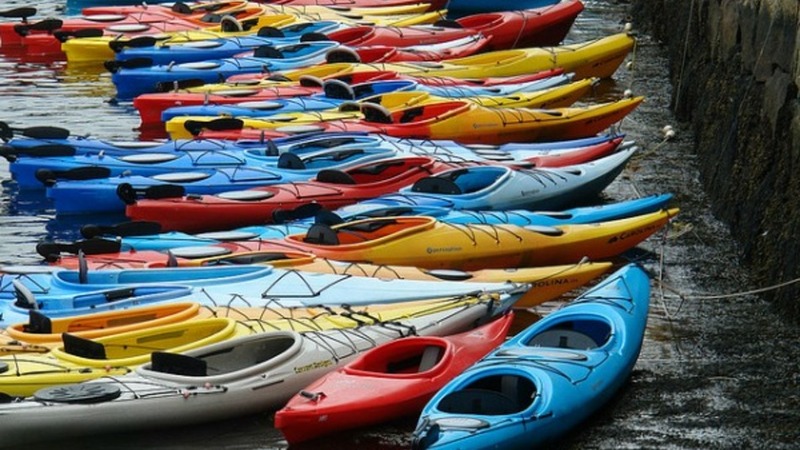 Once you have determined your ideal kayak configuration, go forth and compare prices! Do not forget that you will need a PFD or personal flotation device – these save lives and keep the fun going for a long, long time. You want to bet on kayak races ? Be sure to use a Matchbook bonus code. Previous StoryRafting or canoeing: what are the differences exactly? Next StoryWater sports for children: Which one should you choose?